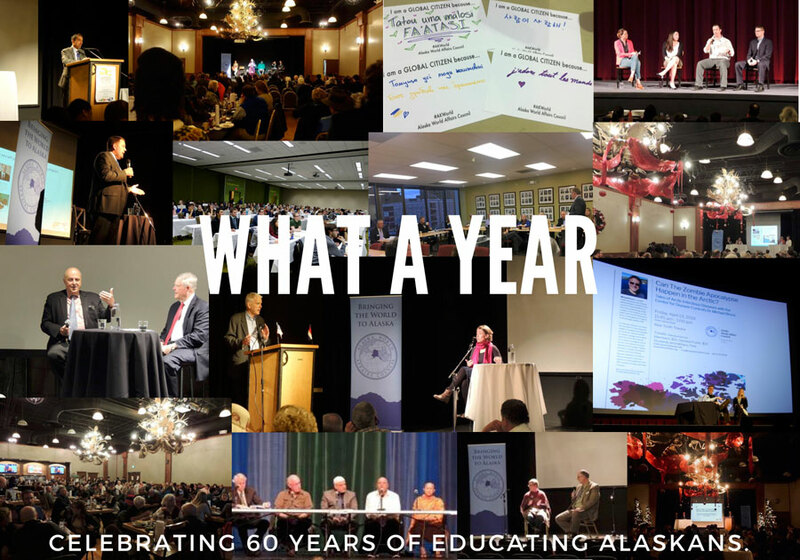 Through regular lunch programs, coffee chats, VIP dinners, school visits, evening programs, trivia night, speed mentoring, and Academic WorldQuest, we have reach almost 4,000 Alaskans directly, 1,600 students, and 40,000 people indirectly when our lunch and evening programs are rebroadcast through our NPR affiliate. Social media outreach touches over 15,000 people each month. 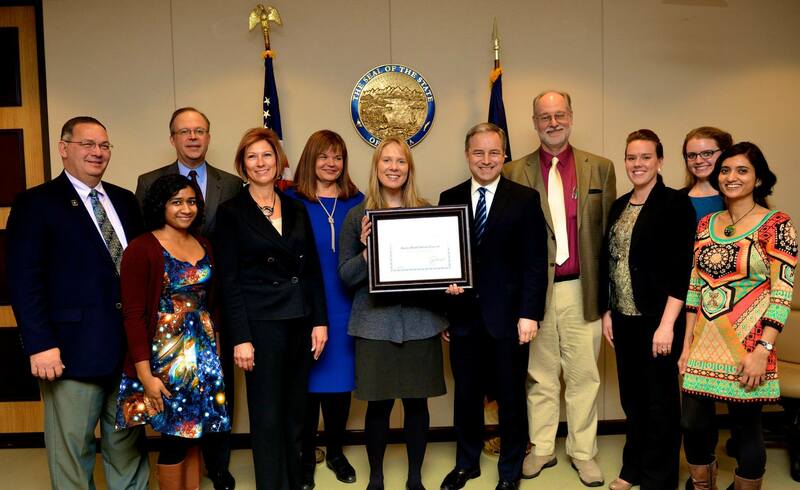 AKWorld Board of Directors, CEO Lise Falskow, and AKWorld Staff received the Governor’s North Star Award for International Excellence from Governor Sean Parnell on November 25, 2014. 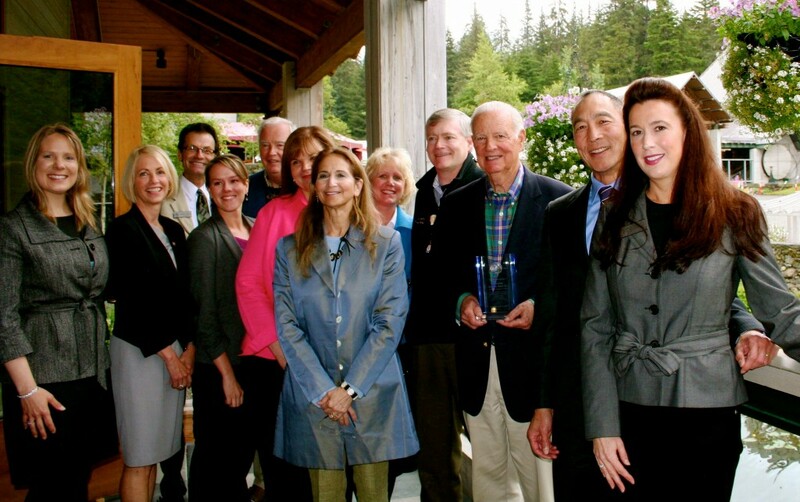 The Alaska World Affairs Council was greatly honored to receive the Governor’s North Star Award for International Excellence for accomplishments in education twice, in 2009 and in 2014. The Governor’s North Star Award has been honoring organizations and companies of international excellence since 1986. The AKWorld Board of Directors, CEO Lise Falskow, Former Senator Frank Murkowski, and Lt. Governor Mead Treadwell presented Secretary James Baker with the first International Award of Excellence on August 26, 2012. On August 26, 2012, the AKWorld Board of Directors, CEO Lise Falskow, Former Senator Frank Murkowski, and Lt. Governor Mead Treadwell presented Secretary James Baker I with the first International Award of Excellence. James Addison Baker III is an American attorney, politician and political advisor. Baker served as the Chief of Staff in President Ronald Reagan’s first administration and in the final year of the administration of President George H. W. Bush. Baker also served as Secretary of the Treasury from 1985–1988 in the second Reagan administration, and Secretary of State in the George H. W. Bush administration. The Beverly Power Memorial Program was established in 1991 and features a world class speaker on a yearly basis. Bev Power, Mrs. James Power, was a long-time leader in the Alaska World Affairs Council, donating untold hours and serving as President in 1968. Bev had a knack for inspiring others to promote and benefit the Council. One of her goals was to bring well known speakers to Alaska to address the Council and general public. Upon her death, a significant donation was bequeathed to the Alaska World Affairs Council Endowment Fund to meet this goal. Each year, we recognize her and her contribution through the designated Bev Power’s Memorial Program. This year’s Bev Power’s Memorial Program will be speaker Ambassador Steven Pifer on US-Ukraine relations on Friday, March 30th, 2018. The Brian Davies Memorial Award was established in 2012 with sponsors sending the winning student team from Alaska’s Academic WorldQuest Competition to the national competition in Washington, D.C. each April. Brian Davies was passionate about the Alaska World Affairs Council WorldQuest competition and led the coordination of the competition for many years. Brian was wonderful at inspiring students to share his enthusiasm for world affairs and encouraging individuals and companies to support the students.